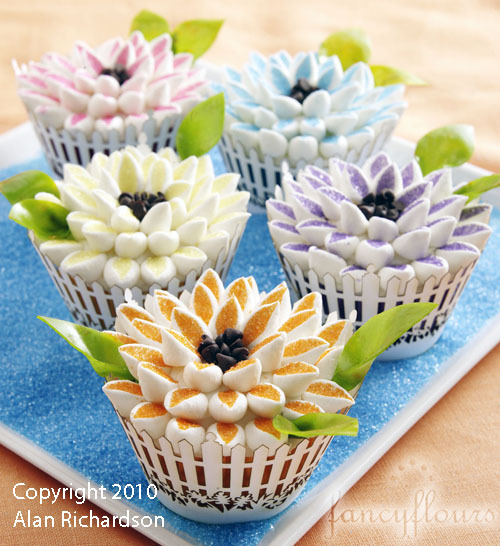 This entry was posted in Cupcake Recipes & Ideas, Spring Baking and tagged Cupcake Recipes & Ideas, cupcake wrappers, fancy flours, flower cupcakes, flowers, mums, what's new cupcake by Fancy Flours. Bookmark the permalink. Beautiful mums cupcakes! Interesting Book.Thanks for the info. Have a Blessed and Happy Day! I do alot of cupcakes and love the cupcake books. I do have a problem tho and dont know how to solve it. When I make the cupcakes the liners pull apart from the cupcake. How can I make this stop. This becomes a problem when decorating the cupcake. Especially for weddings. Anybody have any suggestions? Super glue!, buy the tiny bottles and just dab a little on the inside edges of the liner, it’ll stick great!